Hard Knuckle Contact Gloves in Olive Green and black. 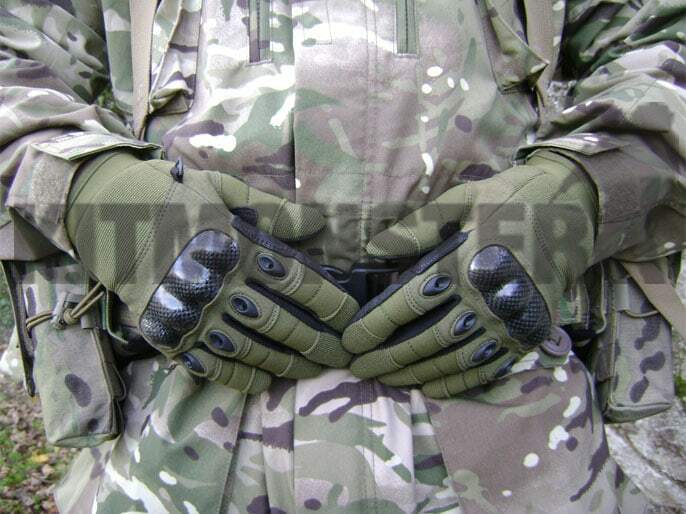 Quick drying synthetic materials throughout, ventilated palm and Velcro adjustment at the wrist. Carbon fibre hard knuckle protective shell as found in sports gloves such as the popular Oakley type. Short fit, these stop at the wrist, reducing heat retention, and allowing use in hot or physically active environments. These gloves are not intended as cold weather clothing. Available in sizes Small (7), Medium (8) or Large (9), numbers in brackets are approximate equivalent UK military glove size.